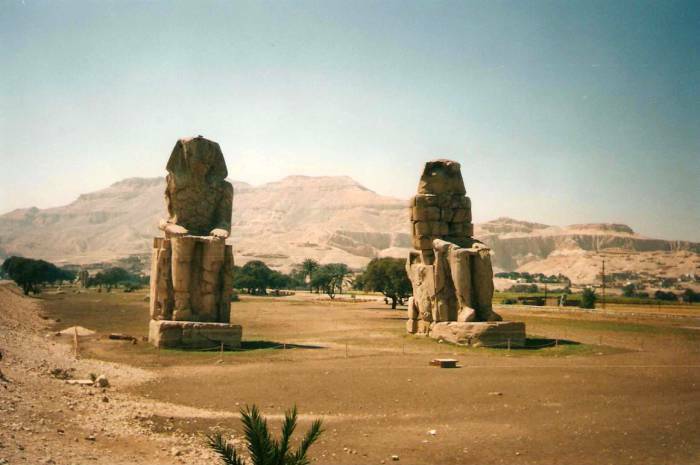 Luxor is about a full day's train ride south from Cairo toward Upper Egypt. 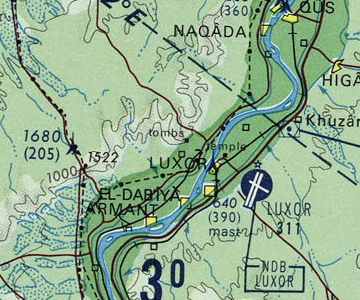 The rail line follows the Nile, the river is within sight of the train for most of the trip. 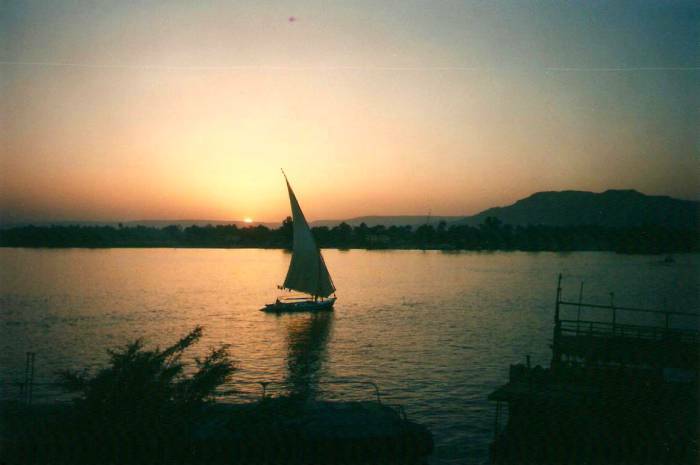 First-class trains are an excellent way to travel along Nile Egypt. 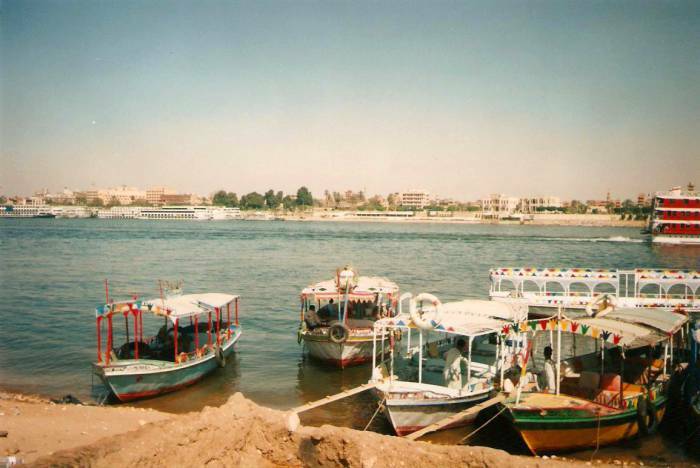 They're the only way to travel if you're taking a long trip like Cairo to Luxor or especially Cairo to Aswan. Second-class trains are acceptable if you're not going very far and have some time to kill. Third-class trains are excellent if you want to see third-world transport so decrepit that it would startle Rudyard Kipling. 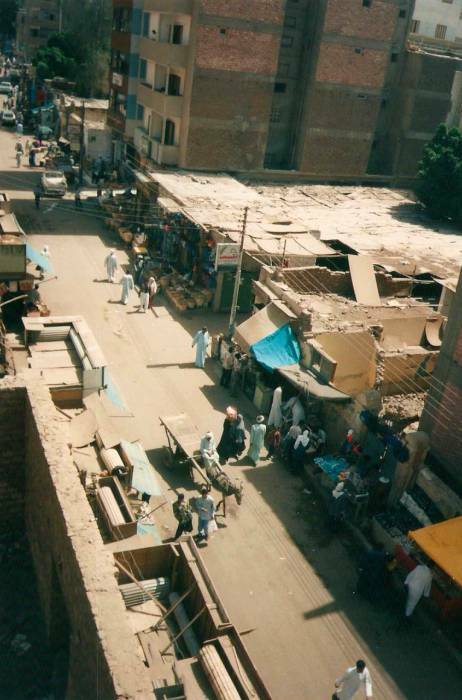 The modern town is Luxor, this was Waset in ancient Egypt and Thebes to the ancient Greeks. Homer described it in Book 9 of the Iliad, "... in Egyptian Thebes the heaps of precious ingots gleam, the hundred-gated Thebes." After the end of the New Kingdom of Egypt in about 1077 BC, the Egyptians called it niwt-imn or "The City of Amun", the major Egyptian deity known as the King of the Gods. It was mentioned in the Hebrew Bible (in Nahum 3:8) as נא אמון or Nō' 'Āmôn, probably the same נא or No (Ezekiel 30:14-16 and Jeremiah 46:25). ONC chart H-5 from the Perry-Castañeda Map Collection. We've made it to Luxor! 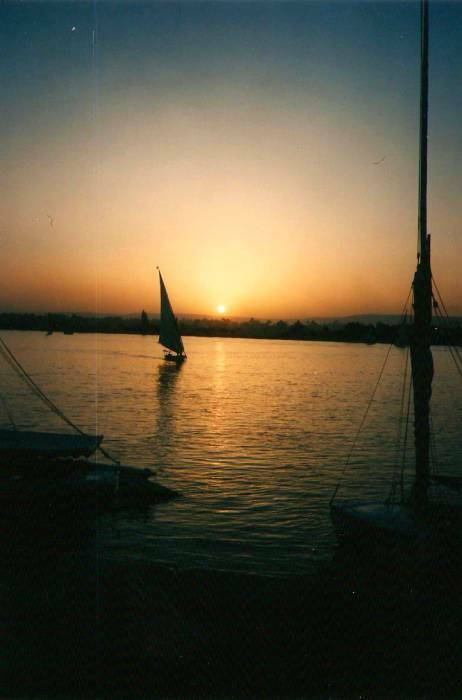 Below, we see some sailboats and a local ferry crossing the Nile between the city of Luxor and the west bank of the river at sunset. The west bank of the Nile was the site of ancient Thebes, with many tombs and memorials to the dead. 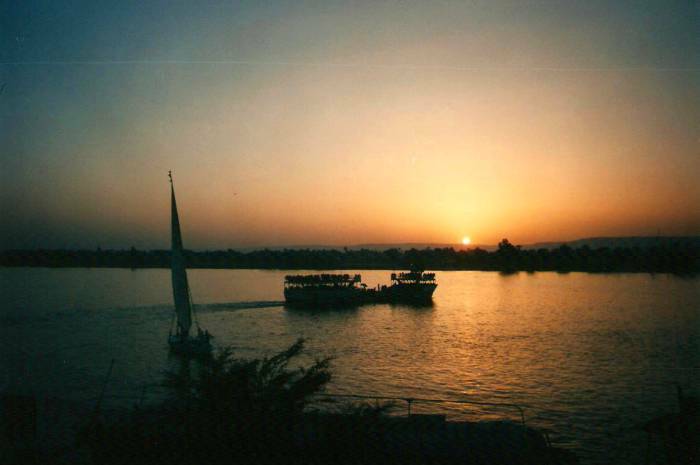 Some smaller ferries take tourists across the Nile from Luxor (on the opposite bank) to the west bank of the Nile. 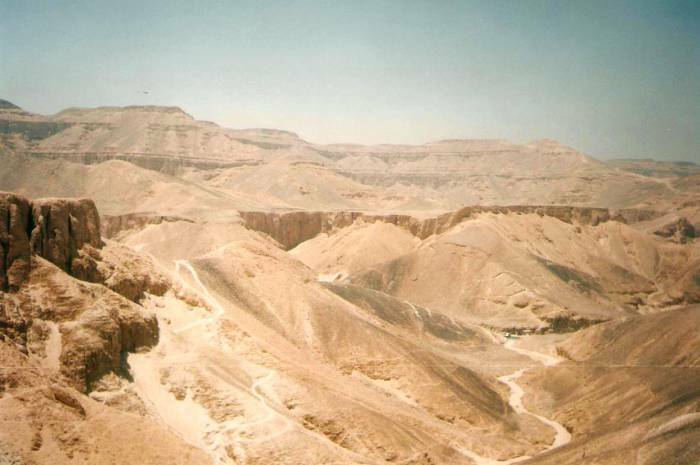 where there are more temples and the Valley of the Kings. You can rent a bicycle in town and transport it across the Nile on the ferry to tour the ruins. I have continued on to Deir al Bahri to see Djeser-Djeseru or "the Sublime of the Sublimes", the Mortuary Temple of Hatshepsut. 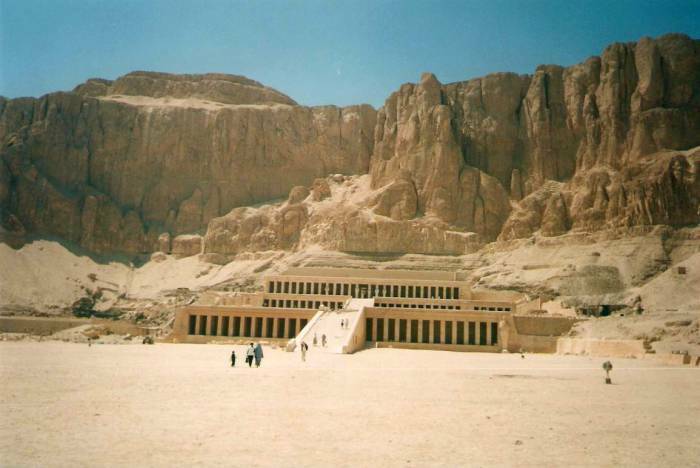 The Temple of Hatshepsut was dedicated to the sun god Amon-Ra. It's a large temple, with three terraces with double colonnades rising a total of 30 meters in height. The terraces are connected by long ramps that were originally lined with gardens of foreign plants including frankincense and myrrh trees. The relief carvings on the interior walls depict the story of the divine birth of a female pharaoh, the first such representation in Egypt. Hatshepsut, born in 1508 BC, was the fifth pharaoh of the Eighteenth dynasty of Egypt, the first dynasty of the New Kingdom. Her stepson and nephew Thutmose III ascended to the throne as a child in 1479 BC. Hatshepsut was the chief wife of his father, Thutmose II. Hatshepsut officially ruled jointly with Thutmose II, but the reality was that she was in charge as the regent. She is considered to be one of the most successful pharaohs, and she ruled longer than any other woman of an indigenous Egyptian dynasty. Egyptian royal family relations are complex — she and her husband Thutmose II were children of Thutmose I, Hatshepsut by his primary wife Ahmes and Thutmose II by his secondary wife Mutneferet, who had the title of "King's Daughter". 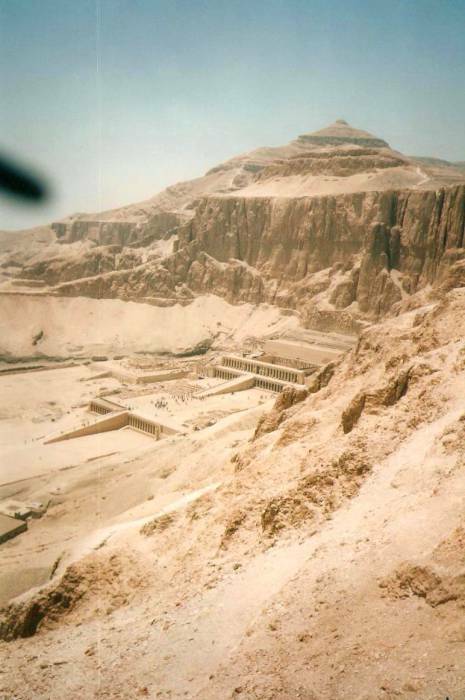 The temple originally housed two statues of Osiris and several of Hatshepsut in various poses. Most of her portraits were destroyed after her death in 1458 BC on the orders of her successor, Thutmose III. The main axis of the temple is aligned to an azimuth of about 116.5°, the direction of sunrise on the winter solstice at this location. Light from the rising sun on the winter solstice penetrates to the rear wall wall of the main chapel, then moves to illuminate one of the Osiris statues flanking the doorway. 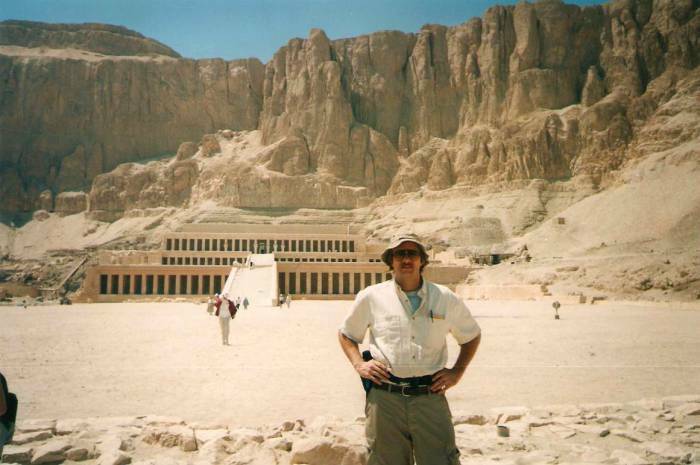 I climbed up above the Temple of Hatshepsut. and toward the Valley of the Kings. When I topped the ridge I was looking down into the Valley of the Kings. 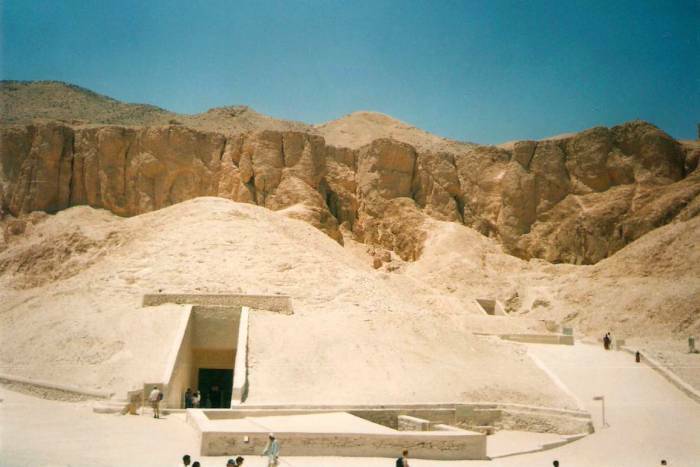 These are the entrances to some of the tombs in the Valley of the Kings. The Temple of Luxor is within the town. It was founded in 1400 BC. This was Ipet Resyt to the ancient Egyptians, "The Southern Sanctuary". The temple was dedicated to Amun, Mut, and Khonsu, the Theban Triad of the cult of the Royal Ka. The gods Amun and Mut were man and consort, Khonsu was their son. During the annual Opet Festival a statue of Amun was paraded down the Nile in a sacred barge from the nearby Karnak Temple to stay with his consort Mut for a while in a celebration of fertility. The Karnak Temple Complex is a larger area of temples, chapels, pylons and obelisks, and other building, two to three kilometers north of the Luxor Temple. The ancient Egyptians called it Ipet-isut, "The Most Selected of Places". 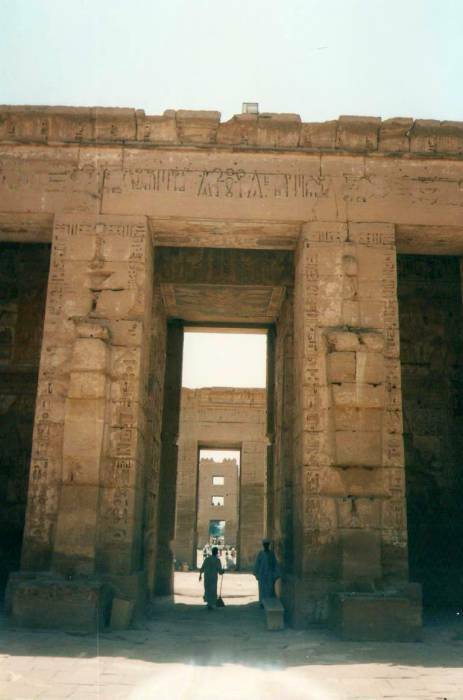 This was the main place of worship of the Theban Triad of Amun, Mut, and Khonsu. After Angkor Wat in Cambodia, this is the second largest ancient religious site in the world. The Karnak Temple Complex was developed and used over an enormous period of time, from the Eleventh Dynasty of the Middle Kingdom, around 2000 BC, down to the Ptolemaic dynasty founded in 305 BC by one of Alexander the Great's generals. About thirty pharaohs were involved in its development, leading to a size, complexity, and diversity of honored deities unseeen elsewhere in Egypt. By the time the Byzantine emperor Constantius II ordered the closing of pagan temples throughout the empire in 356, Karnak had been mostly abandoned. Ήρόδοτος or Herodotus (484-425 BC), the "Father of History", and Στράβων or Strabo (64 BC – 24 AD), another Greek historian and geographer, knew the precise location of Thebes and how far it was up the Nile. Thebes or Θήβαι is actually the Greek name for the city, to the ancient Egyptians it was Waset, the "City of the Sceptre". But medieval Europe completely lost track of the place and assumed it was far downstream near the pyramids in Giza. An unknown Venetian traveler described Karnak in 1589, but the first detailed description was by two Capuchin missionary brothers who traveled through the area in 1668. 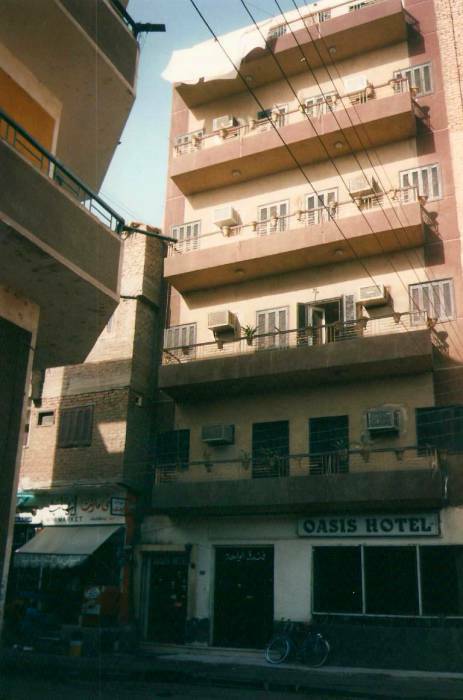 I stayed at the Oasis Hotel. It's located on Sharia Mohammed Farid, phone 381-699. Most rooms have fans, a few have air conditioning. Here is the exterior of the hotel and the view from my room. — Ben, ben! Give me ben! BAKSHEESH!! I told him no, I wasn't going to give him my pen, and I certainly wasn't going to give him any baksheesh. But in less than a block he gave up.